A US Coast Guard icebreaker has carved its way to the North Pole, becoming the first American surface ship to get to the top of the world by itself, officials said Tuesday. The US Coast Guard Cutter Healy, which is based in Seattle, arrived at the Pole on September 5, the Coast Guard said in a statement. The rapid melting of polar ice has sent activity in the inhospitable region into overdrive—as nations eye newly viable oil, gas deposits, mineral deposits and shipping routes like the Northwest Passage. 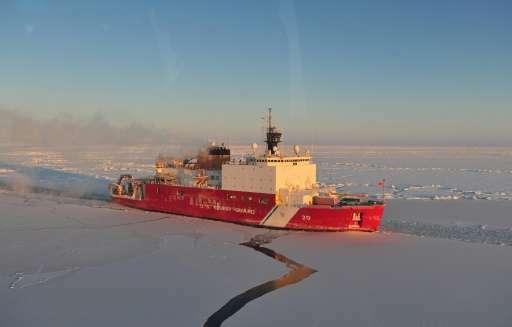 "As the Arctic region continues to open up to development, the data gathered on board Healy during this cruise will become ever more essential to understanding how the scientific processes of the Arctic work, and how to most responsibly exercise stewardship over the region," the Coast Guard said in a statement. Currently the United States has three icebreakers, but only two are operational. Last week, President Barack Obama said he would speed up the construction of a new icebreaker, vital to projecting US power in the increasingly contested Arctic. The Healy's voyage marks the fourth time a US surface vessel has reached the North Pole, and the first to do so unaccompanied. Submarines routinely travel under the Arctic icepack and sometimes surface at the Pole. The Healy is 420-feet (128-meters) long and weighs 16,000 tons. Its 30,000-horsepower engine is capable of breaking over 10 feet (three meters) of ice. The ship's crew and passengers comprised 145 people including scientists who are studying the geochemistry of the world's oceans. Very sad event, we need to preserve the Arctic sea-ice or no way to stop heating below 2C, what a fantasy world.